Thanks. 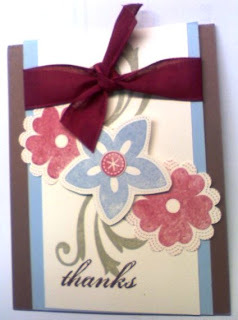 I like this card, do not own the set, and wish I had it ... some days... this was a quick make and take a few months ago, honestly I didn't remember I did this until I was searching for a baby girl card... which I get the pleasure of making since I do not have a spare on hand.. I cannot imagine that!... nonetheless... with the blues, pomegranate, olive and brown.. what a color combo!